Forty-three volunteers gathered along the future home of the Loop the Lake Trail extension Saturday, September 29, to build and install bird boxes, and participate in citizen science monitoring. The volunteers are part of the Onondaga Lake Conservation Corps, an expanding organization of community volunteers who are contributing to restoration projects that are creating or improving wildlife habitat in the Onondaga Lake watershed. 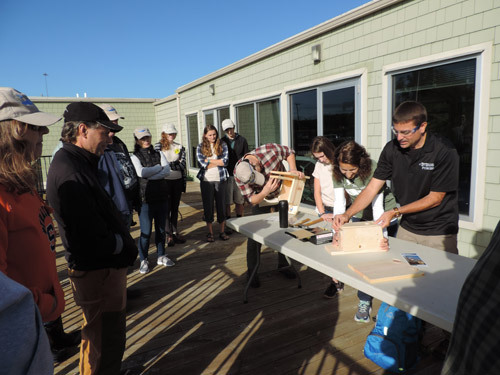 The volunteers built nearly 30 bluebird nesting boxes, which were provided through a partnership with the New York State Office of Parks, Recreation and Historic Preservation, and FORCES (Friends of Recreation, Conservation and Environmental Stewardship). Left: First-time Corps volunteers Ian (left), 6, and mom Rebecca Margiotta, of Baldwinsville, construct a wooden nesting box to attract Eastern bluebirds. Right: Deborah and David Holihan (left), of Liverpool, install a bird box near Harbor Brook. The boxes offer bird species a better chance to survive and thrive, reducing declines in population and restoring species to places they once inhabited. When birds nest in the structures, they have the best likelihood of raising their young successfully. Tom Hughes (right), Natural Resource Steward Biologist with New York State Parks, Recreation and Historic Preservation, demonstrates how to construct bird boxes. Left: Kathy Chapin (left), of East Syracuse, installs a nesting box with Onondaga Audubon volunteer Frank Moses (right) along the southwest shoreline of Onondaga Lake. Right: Three-year-old Eleanor Sunkes, of East Syracuse, decorates a bird box held by Barbara Kamerance, of Central Square, before it is placed in the field. 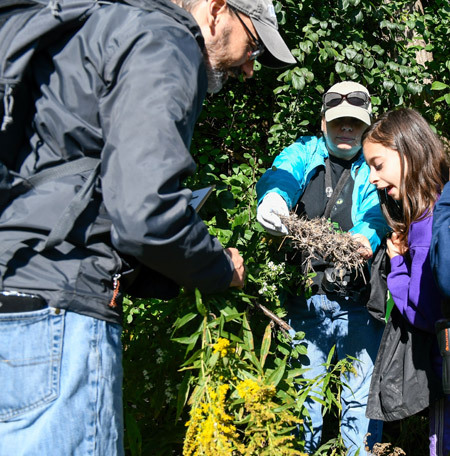 During the event, Corps members tracked native birds on a birding walk along Onondaga Lake’s western and southwest shorelines, and cleaned out existing nesting boxes to prepare them for the next breeding season. Ten-year-old Leah Jarrett (right), of Liverpool, inspects the contents of a nesting box previously installed along the western shoreline with her parents Cathy (center) and Rich Jarrett. Left: Liam Adams (left), 13, and mom Heather Adams, of Cicero, track native birds along the western shoreline of Onondaga Lake. Right: Steve Mooney (center), Managing Scientist at OBG, examines the restored habitat with participants Steven Knowles (right), of Camillus, and Tim Gordon (left). As part of the Onondaga Lake cleanup, Honeywell has restored about 90 acres of wetlands, and about 1.1 million native plants are being planted. The restored wetlands have become home to nearly 260 wildlife species, including more than 120 unique bird species that have been identified in and around Onondaga Lake. Since the formation of the Corps, over 30 events have brought together more than 800 volunteers who have become environmental stewards and Corps members. In recognition of their work, the Onondaga Lake Conservation Corps was awarded a U.S. Environmental Protection Agency 2015 Environmental Champion Award. The Corps was founded in 2012 by Honeywell in partnership with Montezuma Audubon Center and Onondaga Audubon and is now an Audubon New York program. Additional Corps supporters include Parsons, OBG, Anchor QEA, Bond Schoeneck & King, State University of New York College of Environmental Science and Forestry, and Wild Ones Habitat Gardening in CNY Chapter. To learn more about the Onondaga Lake Conservation Corps, visit http://ny.audubon.org/OLCC, www.facebook.com/onondagalakecc, or www.youtube.com/onondagalakecc.